WHY DOES ALMOST NO ONE USE ONE OF THE BEST INTERNET SECURITY TOOLS NEARLY EVERYONE ALREADY HAS?!!! If you don't enable your status bar before you leave your website, you're just ASKING for a virus! I used to work at a computer lab at a local community college, tutored there on the side, and took classes as well. 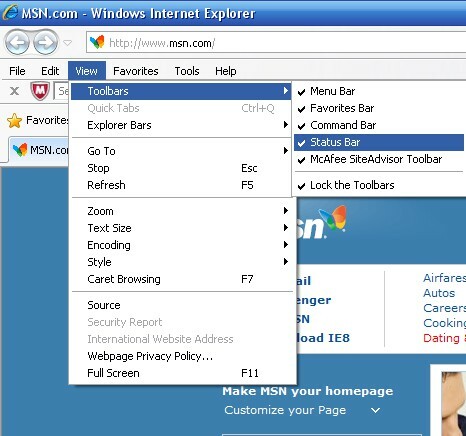 One of the most powerful internet safety tools I found to be ridiculously under valued was the status bar. It's a fantastic tool although its title is somewhat misleading from its best purpose. The title of the "Status Bar" suggests its primary intention- to let you know the "status" of the website your visiting. The commonly accepted purpose of it is to let you know if a page is working or not, things you can usually rather obviously tell. Accordingly, most browser producers turn the status bar off by default. This is a serious mistake. Web surfers should be educated to the golden usage of the status bar: To let you know where you're going- before you get there. The status bar shows you the actual internet address of the link you're holding your mouse cursor over. Please turn the status bar on in your browser. 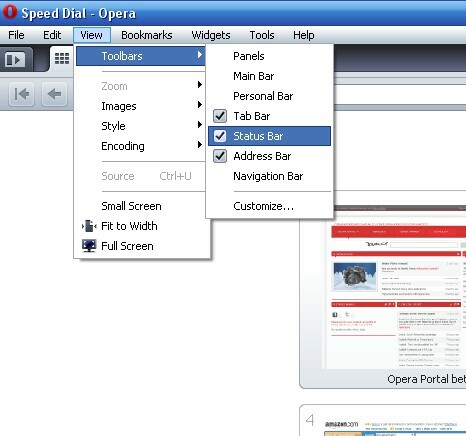 Please choose: FireFox, Internet Explorer, Opera, or Chrome. See at the bottom, where it tells you the actual address of the website your visiting? Be aware that there are tricks and hacks which have been able to change the status bar in the past, though securities are getting better. Good luck internet surfers, captains, and tourists. If you would ever like to avoid untrustworthy sites brought up in Google or Yahoo's lists, you might want to check out my number #1 plugin review for IE and FireFox: McAfee Site Advisor. I consider it invaluable and I am not paid or endorsed by McAfee to promote it. It's that damned good. Hosted by HostNine This page was created in 0.00411009788513 seconds.